England centre Manu Tuilagi says he will take some time after the Six Nations to make a "massive decision" over his club future. The Leicester man is weighing up an offer from French side Racing 92 for a move after the Rugby World Cup. 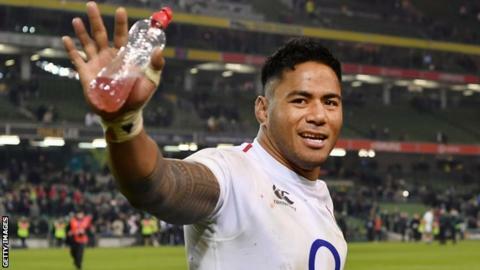 Tuilagi, 27, is out of contract with the Tigers this summer but would not be available for England should he move. "Sometimes you have to give something to get something," he told BBC 5 live. "I need to take time to think." "At the moment I haven't made a decision. I will focus on the Six Nations first and after that think about what is right for me and my family." Tuilagi returned to the England fold in November after a lengthy absence through injury, making his first Six Nations start in six years in the victory over Ireland in Dublin at the start of the championship. However a move to France could spell the end of his international career, with the Rugby Football Union only selecting players who play domestic rugby in England. Leicester head coach Geordan Murphy fears Tuilagi could be tempted by a lucrative offer by Racing after the England international travelled to France to discuss terms. "We'd like Manu to stay, but we simply cannot match the salary in France," Murphy told BBC Radio Leicester. "We put the best package we can on the table and we will speak to his agents over the next couple of weeks. "It's a little bit difficult in that he's away with England." Tuilagi has played all his professional rugby for the Tigers, making his debut for the club in 2010 before his England bow a year later. "Manu has to do what is best for him. Sometimes it will come down to a really tough decision, in regards to finance and the legacy he leaves behind here. "It's a big couple of weeks for him - you want him to go away and focus on his performances for England, and this is a little distracting for him."